212 pages | 15 B/W Illus. Especially since the 2003 SARS crisis, China’s healthcare system has become a growing source of concern, both for citizens and the Chinese government. China’s once praised public health services have deteriorated into a system driven by economic constraints, in which poor people often fail to get access, and middle-income households risk to be dragged into poverty by the rising costs of care. 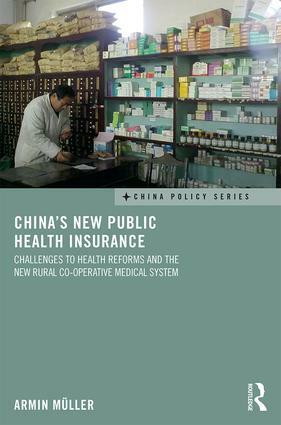 The New Rural Co-operative Medical System (NRCMS) was introduced to counter these tendencies and constitutes the main system of public health insurance in China today. This book outlines the nature of the system, traces the processes of its enactment and implementation, and discusses its strengths and weaknesses. It argues that the contested nature of the fields of health policy and social security has long been overlooked, and reinterprets the NRCMS as a compromise between opposing political interests. Furthermore, it argues that structural institutional misfits facilitate fiscal imbalances and a culture of non-compliance in local health policy, which distort the outcomes of the implementation and limit the effectiveness of insurance. These dynamics also raise fundamental questions regarding the effectiveness of other areas of the comprehensive New Health Reform, which China has initiated to overhaul its healthcare system. Armin Müller is a Postdoctoral Fellow at Georg-August-University in Göttingen, Germany. With the rise of China and its impact on the world, interest in China has increased drastically in recent years. This series focuses on policy-oriented research and scholarly works with policy implications, on all aspects of contemporary Chinese economy, politics, society, environment, journalism and cultures. It also covers China’s foreign relations with major international organizations such as the United Nations, World Trade Organization, and World Bank, and major powers such as the United States, European Union (and its member states), Japan and others.